This is looking between W and NW about 10 min's later. I was amazed by what I was seeing. You can see streaks of material from the centre extending to the R. This was some kind of in-flow. The streaks where moving from R to L into the storm as if it was digesting the material for fuel. I could see it getting slowly drawn in. The rain was picking up now and I decided that I really had to move for my own safety. I was in the worse possible place if another bolt fired out. I was on very high ground exposed in a middle of a field and to my L was a small forest which was a tempting place to shelter, however the forest had tall trees so this was a major no no. I decided to run down the steep slope into the field near the Coleraine Road. This was on much lower ground. 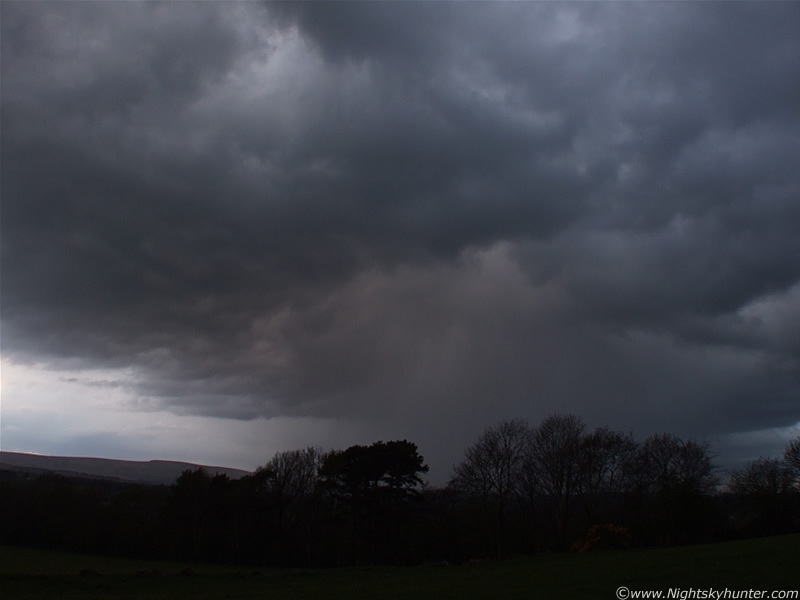 Then an extremely heavy shower began, intensified, followed by small hail stones. This hail was not remarkable for its size but for its speed. The heavens opened up and all hell let loose. 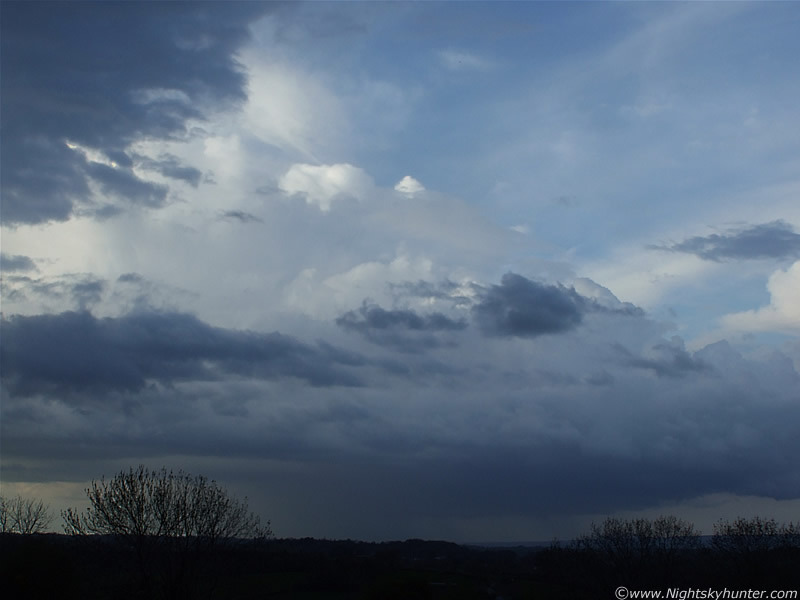 I knew that the precip core in the above image was over me. There was a row of small bushes near the road with overhanging branches which made a good make-shift shelter. These were the lowest trees in the area so I felt safer. Like a prat I had to bend low and crawl under the canopy for cover. The temp dropped like a stone and the hail storm done it's thing for about 20 min's. I should have took a video clip of it but I was getting badly soaked so I decided to keep the camera covered. Shifting myself to the side I looked up through a gap in the branches and stared straight up into the hail core at the zenith. It was a huge stunning sight. The thick sliver bands of hail were not falling in a straight line but were spreading out from a central core which reminded me of the nucleus of a giant comet with dust jets erupting as it rotated. This was an impressive sight, and the same sector which produced the bolts. Those c-g's are extremely dangerous, many people are killed each year by them. In many cases the lightning has struck when the storm has moved away. This is a false sense of security with people, when the rain stops they think it's safe to go outside, however lightning can hit you from more than 10 miles from its parent storm. (Lightning safety tips). The rain turned to a fine drizzle and a clearance opened up in the NE. Miles away was another big cell. I didn't see anything come out of it but I'm sure it was a thunderstorm. It's moving away from me here, slowly. The main updraught tower is to the L which has glaciated into a cb. There's a flanking line of new towers to the right which kept the cell active. This is a multicell. Closer in. It's quite a beefy cell indeed. This cell was trying to produce a funnel. 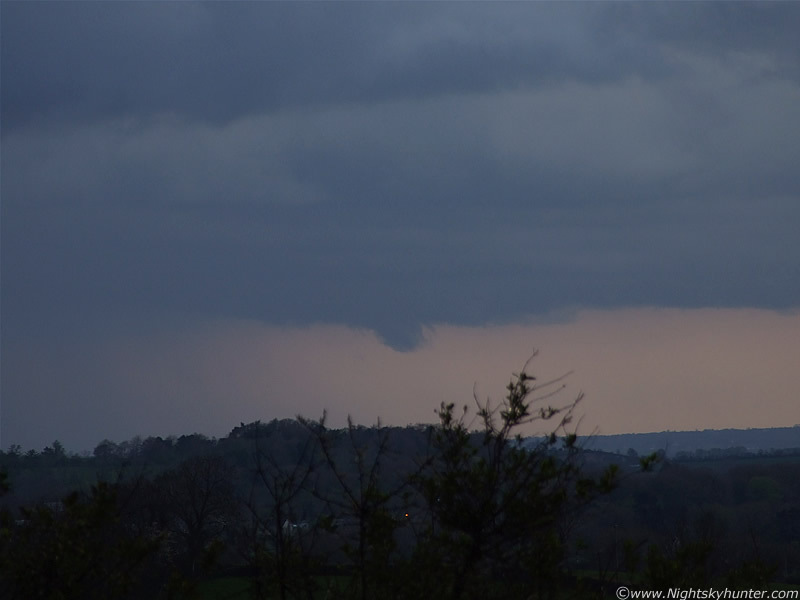 Over a period of 30 min's I watched many lowering's drop from the base and move around. At one stage there was three at the same time. The other two vanished but the main one put on a great show. I believe this was another rotating storm. 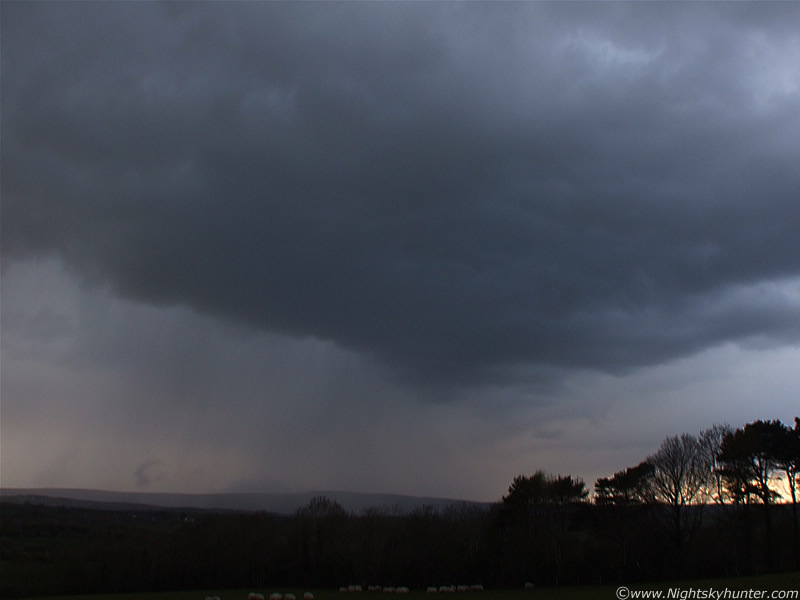 This lowering caught above was much more spectacular. At one stage it was almost half way to the ground and curved into a classic funnel shape. I never managed to get an image of it at its most spectacular stage because I spent most of my time watching the first storm. The pink sky in the background done wonders for photography. I hoped it would drop a big funnel or tornado - what a scene that would have been. You can see the striations on the cell base. 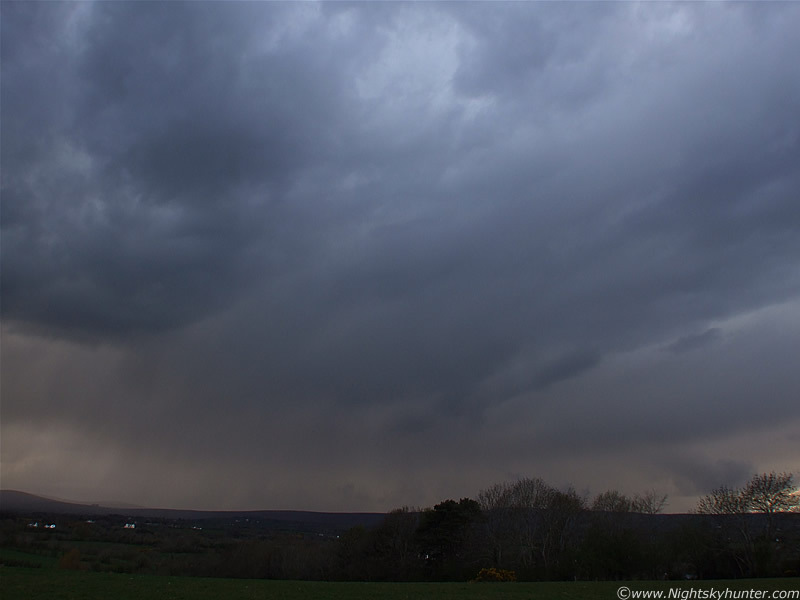 The precip core is to the L. I got another text from Conor, from Glen Shane he had been watching the lowering also and agreed that this was trying to drop a good funnel. 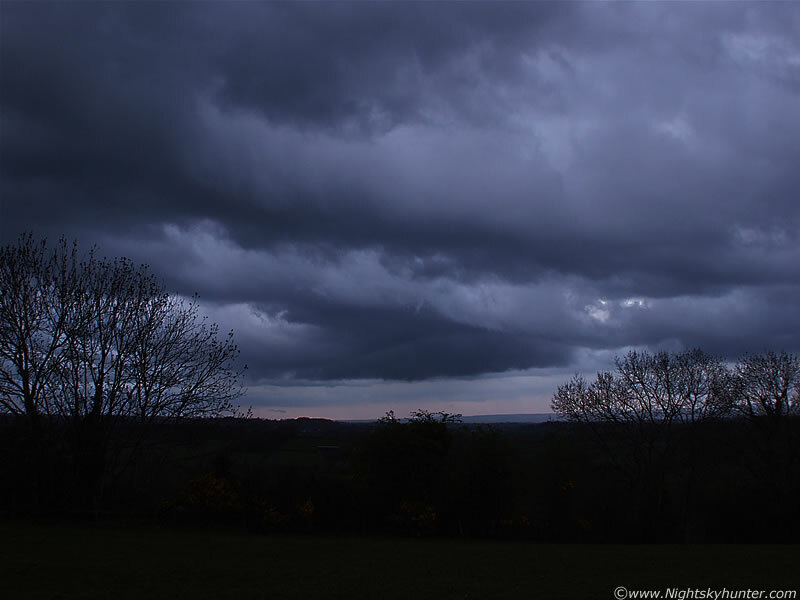 He also informed me that there was another cell approaching me from the S, it was over Slieve Gallion and heading my way. Here it was!. It had crept up on me from the S at my blind spot. It suddenly moved into view over the forest with great structure. This must have been some kind of outflow boundary at the leading edge. Facing SE here. The cell was moving from R to L. Amazing colours appearing now. Animals must be very much in tune with their environment. When the first storm appeared they got very unsettled and made loud calls as they grouped together just min's before the lightning. They were doing it again now. They even look unsettled in the image. Storm propagating further N with spectacular colours. I was amazed to watch this cell 'breath' in real time. Above those trees to the R, long tendrils of scud where getting sucked up at an alarming speed into the inflow area. It was fascinating to watch. Overhead there was another area of vorticity as the scud rotated. This is the third cell of the day with rotation!. Now facing E at the same cell. It's now producing heavy rain which I could feel from here. Look at the lonely piece of scud to the bottom L near the mountain. That scud was blown down very quickly with the out-flow. The same cell from the bottom of the hill facing SE showing a larger area of the base. Looking to the NW at the first storm. It was not electrified any more however the structure was fantastic. A great hail core with stunning pink and purple base. I deliberately placed the core off centre to the R so I could show the rear of the cell. Storm has propagated further to the N. This is a slightly slower shutter speed. The Sun was about to set and the light levels were almost gone. You can even see these colours on the video clip. This was the other area which amazed me. 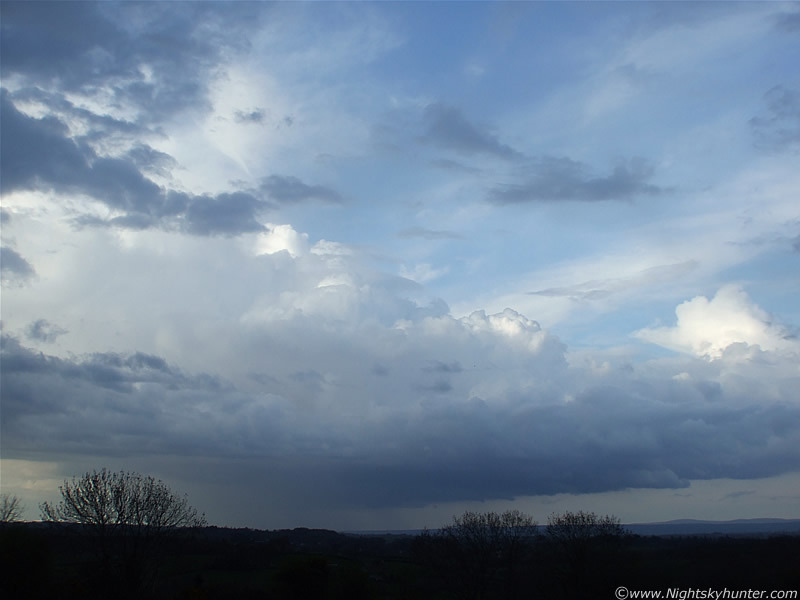 This is looking E of N to the RHS of the above storm. I had never seen structure like this before. At first I didn't know what the heck it was until I noticed the movement. These are superb in-flow features. 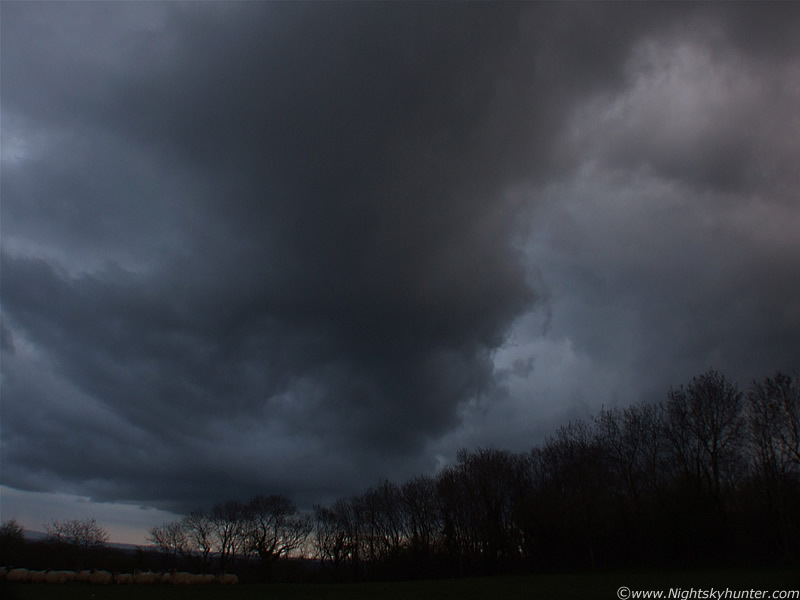 The three horizontal bands of cloud where moving to the L (cell moving away from camera) as the first storm (out of frame to the L) sucked them in. This storm was still feeding. 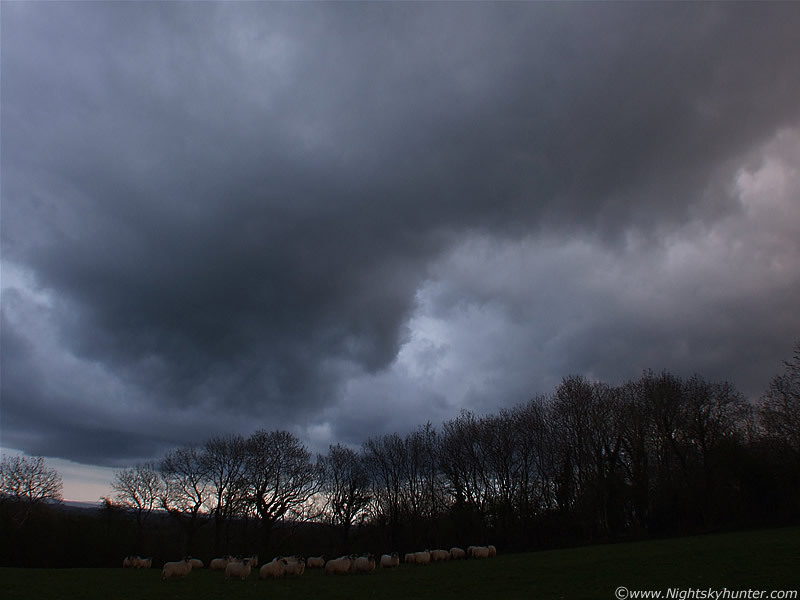 Due to the dark sky I had to open the aperture wide at F/3.2 to collect as much light as possible. At a first glance I thought that long dark shape was a long funnel tilted into a horizontal position by strong updraughts but it was in the wrong area to be one. I stayed out until it was completely dark and when persistent rain began I decided to bring the session to an end at 21.30 BST. 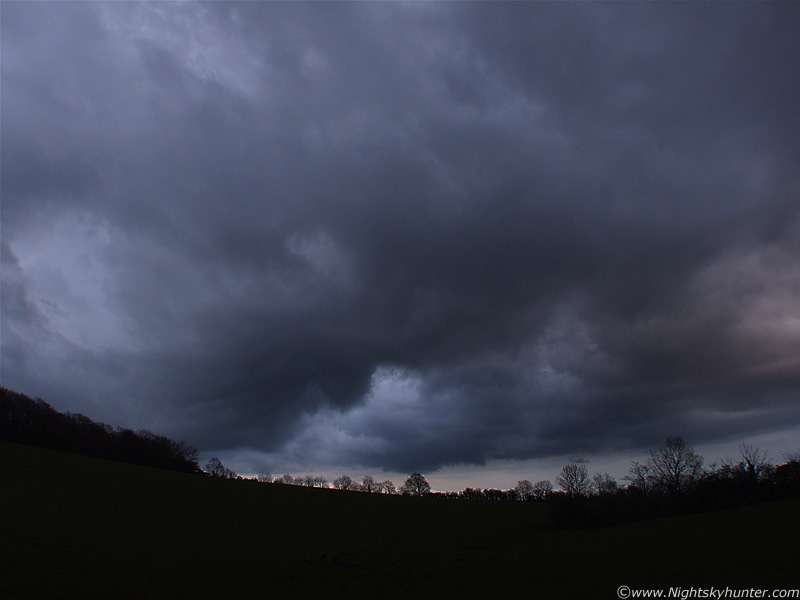 I was very pleased with the action, after a disappointing start I ended up with three rotating storm cells and lightning, and this is only April. The 2008 t-storm season has got off to a great start. I can only imagine what the Summer will bring!. Here is video footage of the cool structures. The movie mode on my digital camera always overexposes any scene and there is no manual override to control the exposure so the footage doesn't show the darker details. However you can still see the structures and colours. You will also hear me talking to myself. Pity I didn't catch the lightning. I'm determined to catch some bolts very soon so watch this space. Hope you enjoyed the report.